One of the greatest fears that all people face as they age is the loss of memory and in particular, the onslaught of degenerative mental disease like Alzheimer’s. Our ability to remember things provides us with a sense of security in who we are, what we can do, what and who we can rely on, what our plans are and what role we play in the wider society. While it is often accepted that ageing comes with memory loss, this is actually something that is preventable with good brain training and healthy lifestyle habits. We often think of memory as the ability to store, retain and retrieve specific pieces of information, derived from previous knowledge or experience. However, contrary to popular belief, memory is actually not based on your brain’s storage capacity for information but on the series of neural processes which register and encode information for later retrieval and use. As we age, our ability to do this does deteriorate a little – however, the rate and amount of deterioration is not simply dependent on our biological age but also on our lifestyle and habits. Basically, like other parts of the brain, the more you use your memory, the more powerful it will remain. In other words, it is possible to prevent memory loss and deterioration by exercising your brain via specific activities. Keep challenging your memory – this does not mean that you have to do complicated mind puzzles all the time or attempt to memorise long tracts of literary texts! It can be as simple as breaking your normal routines to force your brain to use new pathways of cognitive function or using your own memory instead of relying on gadgets (eg. key in a person’s telephone number from memory rather than using your technological address book). Learning new skills is also a good way to challenge memory and your ability to retain information – for example, learning a new language or taking a course on a certain topic. Use your senses – learning to pay attention to your senses and to use them more to embrace experiences more fully will also help you to retain information better. Play mind games – this can be anything from a simple children’s board game to traditional board games like chess to more social games like bingo – or even the new high tech brain training video games. Anything that requires you to use your brain in different ways is good. The incentive of winning often prompts us to try harder. 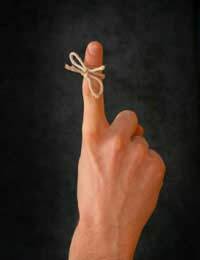 Use memory tricks – there are many ways to help you boost your ability to remember information: you can use association – relating new information to any old information that you already know – and this also helps because it requires you to build on previous knowledge; you can use memory techniques like “chunking” which encourages you to remember short lists and you can use simple techniques like repeating and rehearsing. Organise yourself – boring as it may sound, being organised does help your memory. Not only does this make things and information easier to retrieve but the act of organising actually helps to imprint things in the brain and force you to arrange information into categories and work out relationships between them. Write things down – this is not a sign of weakness or poor memory! Writing things down, like organising, helps to imprint information in the brain and aids in information retrieval and organisation. Keep stress under control – you are more like to forget things and become confused if you are stressed. In fact, the main stress hormone, cortisol, can damage the hippocampus in the brain if it remains in the body at consistently high levels. So find ways to manage stress levels, whether this is through a relaxing hobby, talking to friends and family, exercise, listening to music or other creative pursuits. Maintain healthy lifestyle habits – your lifestyle, activity levels and diet can have a significant impact on your brain function and on your memory abilities. Make sure that you get enough sleep and regular exercise; and opt for a diet high in foods that help brain function, such as berries, broccoli, sweet potatoes, nuts & seeds, red tomatoes, spinach and other dark leafy greens, citrus fruits, liver, black beans and other legumes, oily fish and green tea.